Here’ are all our ingredients: Flour, water, a stiff levain build I mixed up the night before (I’ve done these numerous times already so I skipped the photos) then a little yeast, salt, some good olive oil, our cheese being half grated and half chunks. Into the mixing bowl I added everything but the cheese and started the shaggy mix step. While that was getting together, I chopped the chunky cheese into smaller bits which were then added, along with the grated stuff, to the dough once it had become “shaggy”. 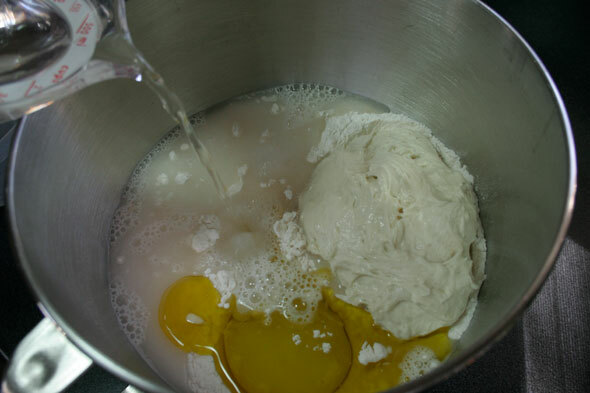 This was then set to knead with the dough hook for four minutes more. 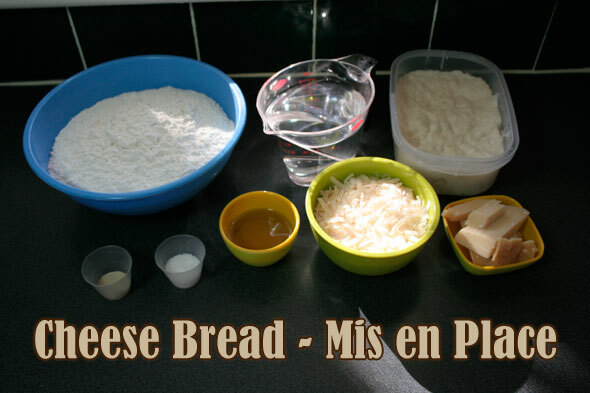 In this instance, you can forget looking for a “windowpane” as the chunks of cheese won’t let the dough show you when it’s been kneaded enough. So here, I judged by time and looks. 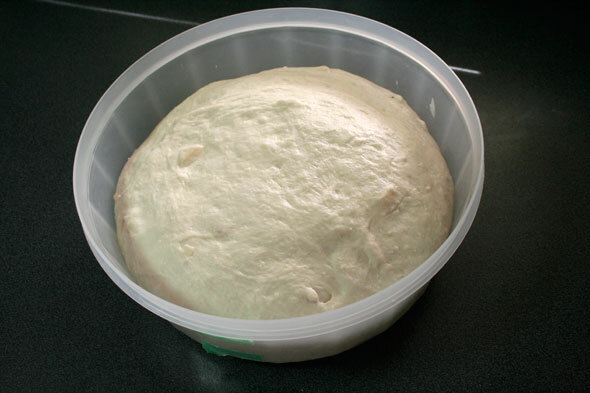 Once the dough had mixed & kneaded enough, it went into the lightly oiled bulk proofing bowl (I used a little EVOO here) and let this proof for about 2½ hours with two stretch and folds at the 50 minute marks. 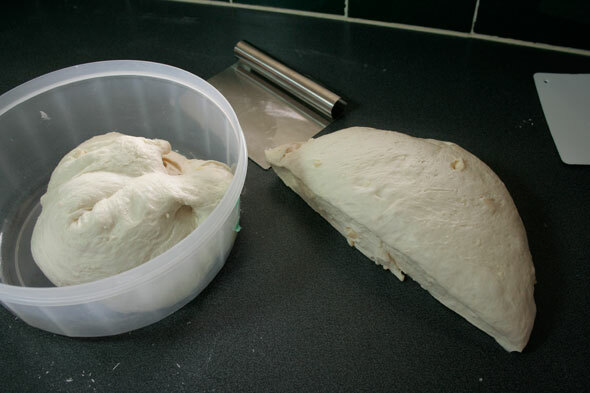 Once the dough had pretty much doubled, I divided it into two portions and prepared to shape. 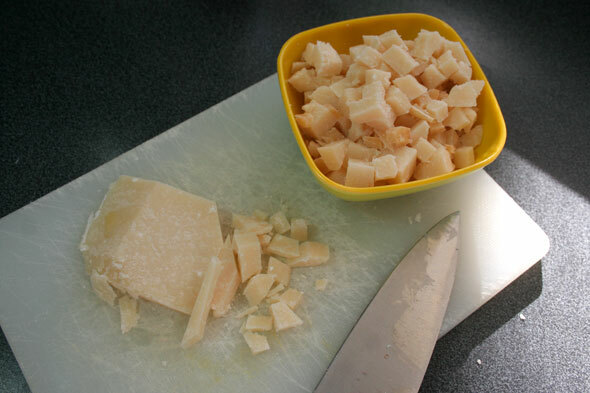 The cheese chunks made shaping a little more tricky than normal but just a bit. 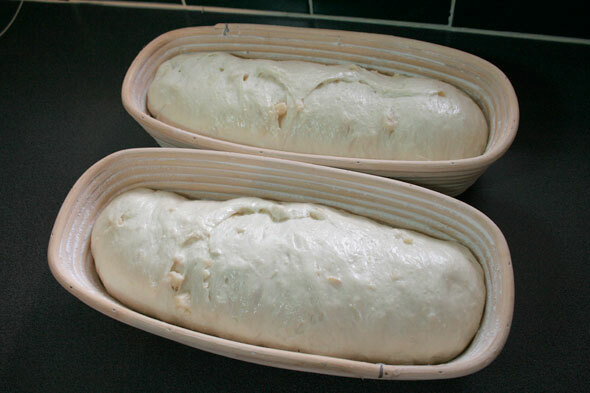 I formed the dough into two loaves and laid them, seam side up, into the brotforms. They were left to do their final proof for another 1¼ hours, doing the poke test and of course visual check to see they had risen enough. So what is the poke test? It’s a generally easy way to check and see if your final proof shaped bread has had enough rising time and not too little or too much. 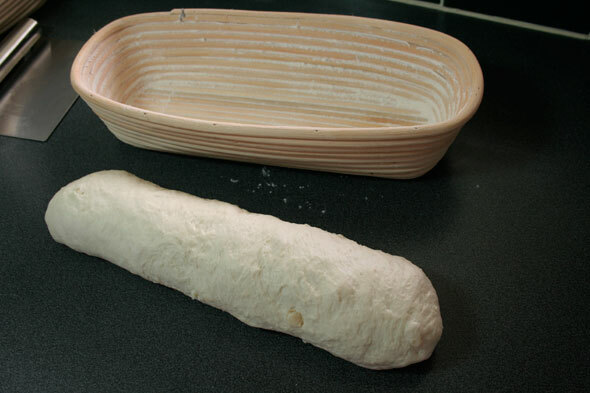 Basically, when the dough has proofed almost as long as the recipe suggests, you take a wet or floured finger and poke a not too conspicuous spot on the laof, sinking your finger about a half inch (1.5 cm) into the dough. If the dent you just made fills in almost completely and right away, the dough needs more proofing time; it’s too tight and isn’t relaxed enough; give it another 10, 15 or 30 minutes more. If the divot you make stays fully indented or nearly so and does not reshape much at all, then you’ve overshot the proofing. Get it in the oven but don’t expect as much oven spring as you wanted. 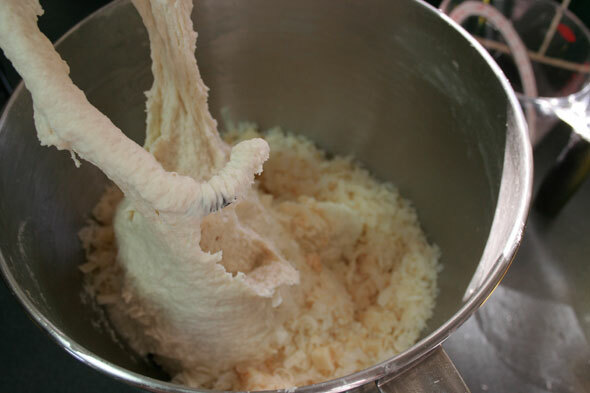 If the hole fills up in several seconds to about halfway back, your dough is where you want it to be. Now at this point, just feel the dough and try to memorize what this density feels like to your hand. Do the same when your dough is not quite there yet and if you overshoot, you want to feel these too with an eye to getting this tactile resilience embedded into your memory so that at some point, you’ll know what “just right” feels like without needing to poke but just a quick touching of the loaf. 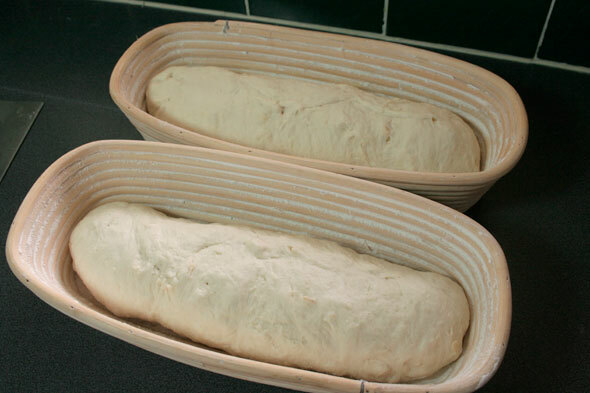 Once the bread has reached the right amount of proofing, turn it out (seam is now side down) and slash as desired. The oven was set to 460º ahead of time. 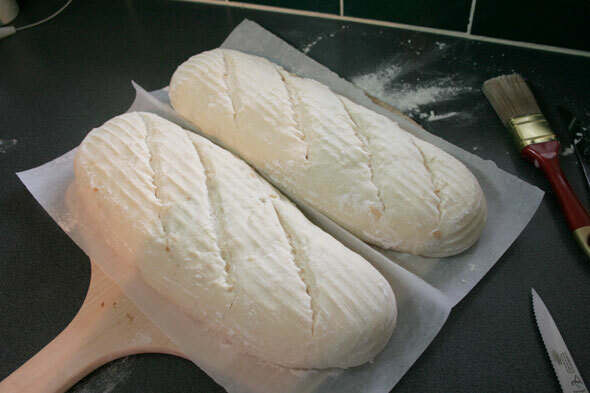 The slashed loaves go onto the stones in the oven along with a good shot of steam. Notice I’ve chosen to place the loaves on two separate strips of parchment, this avoids the dough sticking to the peel during transport into the oven as well as letting me independently move the loaves around easier once they’ve baked for a bit. 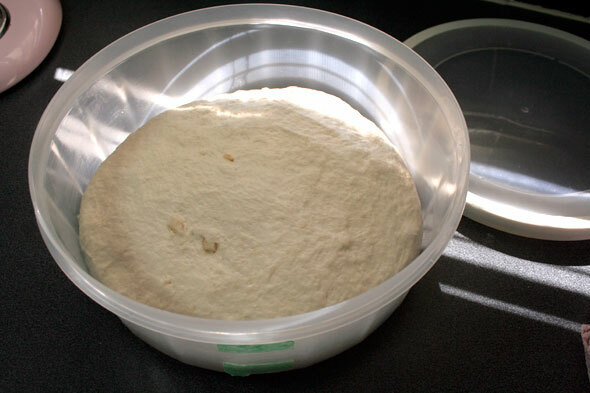 After 15 minutes and once the crusts are set, the oven is turned down to 440ºF to bake another 25-30 minutes. You’re aiming for an internal bread temp of 205ºF. Here they are just out of the oven, a lovely colour and just a few spots where the cheese chunks melted on the crust. The oven spring was excellent. Some Mellow Bakers found that their cheese “drips” baked too much and became bitter so have opted to use ALL grated in their next bake. I didn’t find mine to have baked too much. They had a strong concentrated flavour but had not turned bitter. 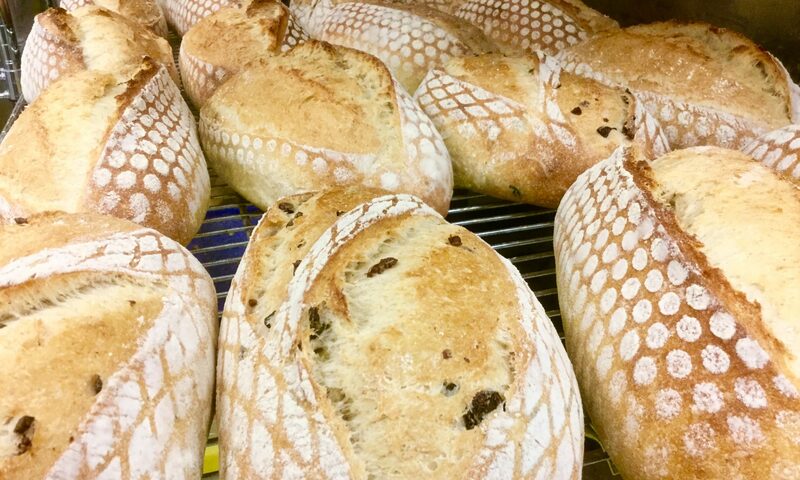 If I had left the loaves in much longer, then I’d expect the drips would have started to over-bake even if the crust was still a mid-tone colour. These loaves are left to cool before slicing. We had this bread along with some fresh made squash soup which complemented the flavourful slices very well. The crumb texture was slightly open, not too dense or tight. There were lots of inside pockets of melted cheese where the chunks has resided. This was a very nice, very flavourful loaf. It would go very well with deli meats, of course, and bolder menus. We like it a lot and the first loaf was gone between just the two of us by lunchtime next day. A success by all accounts. You can go visit other Mellow Bakers who made this loaf here. 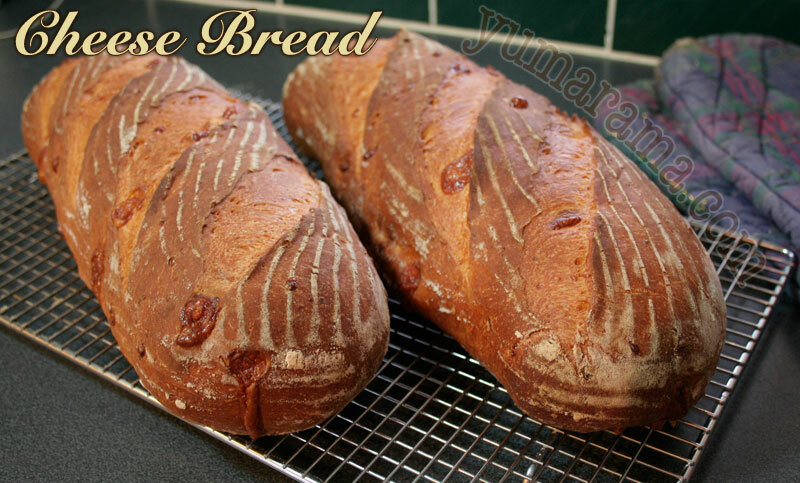 There was an interesting variety of outcomes, both in overall results and how the loaves were finished. And now a bit of personal info. This is going to be my last bread post for a fair bit, maybe a couple of months, as we decided a while back that we were going to “get out of the rat race” and go across the country, move house and home and pets from (close to) Toronto and over to beautiful and very MELLOW Vancouver Island, a mere 4,300 km away, which is about 2,700 miles. We don’t have a specific destination or even time for getting settled, we’re hoping to make the trip across a journey onto itself. So if you start seeing some “travelog” type posts in the next while instead of the usual bready stuff, this is why. I don’t know for certain how our Internet connection will be during the actual trek, I may or may not be able to post full on blogs, but at the very least, I’ll be taking photos and trying to keep notes; there will be plenty of “just sitting” time during the road trip, after all. In the meantime, we have to get the house cleared out and sold, decide whether we’re hauling a simple U-Haul type trailer or a mobile home and get out butts out the door. So check in now and again or sign up for the RSS Feed to get notified of new posts as they get made. I’ll miss your bread posts, Paul, but good luck on the move and have so much fun on the trip! Sounds like an amazing time!! 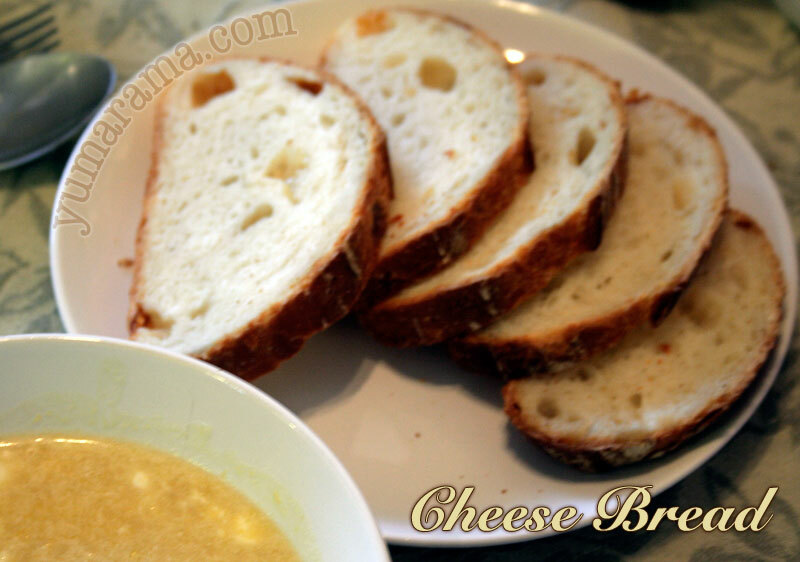 Oh, and the cheese bread looks wonderful ~ kinda makes me want to bake it again right now. beautiful loaves as usual. Wish mine weren’t all gone, like Abby says, maybe have to bake them again. @Joanne: No, we’ll not be gone for an undetermined bit yet. However, all my baking equipment is packed up as we get the house ready to sell, so bread is “off the table” already. I’ll keep poking about for a bit yet. I started following your blog only recently, and then you decide to go off gallivanting across the country? :). Ah well… life is a journey, not a destination. See you again in my reader when the dust settles. Good luck on your move! Will miss your posts! Vancouver Island has to be one of the most beautiful places that I have ever visited! Have a great adventure.